Happy 2010! I can't believe how fast the last year flew by. So much occurred in the last 12 months....most notably welcoming my little Kyler into the family last March. I can't wait to see what this year holds. I spent the holidays in northern Michigan so I was away from my laptop AND sewing machine for over a week. Talk about withdrawal! I have only been home 2 days but have been busy working on 3 different quilts to show (hopefully) soon! In the meantime, I wanted to share the pillows I made for my mother-in-law for Christmas. She gave me some scrap fabric that was left over from 2 chairs in their family room. 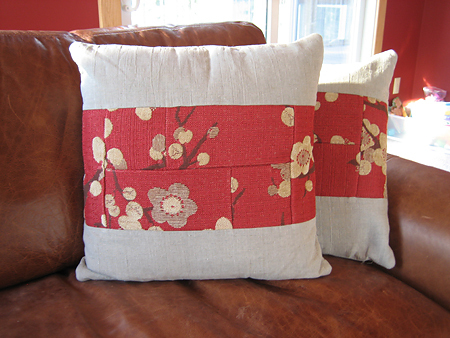 Inspired by this pillow by Meringue Designs, I immediately ordered some linen and created four pillows. 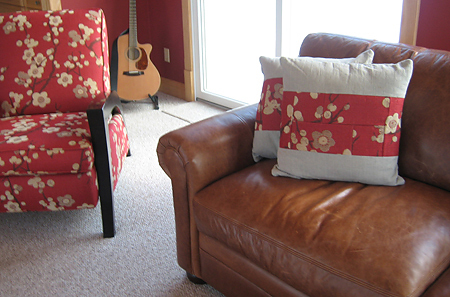 I didn't have a variety of fabrics like the pillow from my inspiration, so I cut squares and rectangles out of the same fabric and sewed them together. I think it made for a pretty interesting design. As you can see here, they match the chair! I hope everyone had a wonderful break with their families and look forward to see what you all create too in 2010!